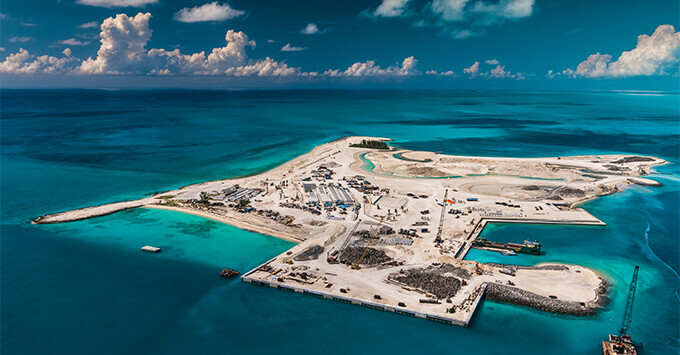 (2:14 p.m. EDT) -- MSC Cruises today revealed it has entered the final phase of construction on Ocean Cay, its private island in the Bahamas, located 23 miles south of Bimini. After delays, the Caribbean marine reserve is now scheduled to open in November 2019. The former site of an industrial sand extraction plant, Ocean Cay will feature eight beaches, a shallow-water lagoon, excursions to neighboring cays, a wedding chapel, and a number of bars and restaurants that will serve authentic Bahamian flavors. MSC has voiced its commitment to strengthening the Bahamian community by sourcing local materials and using local vendors when possible, and employing up to 140 Bahamians for permanent positions on Ocean Cay. Important to the island's development as a cruise port of call, a pier will allow cruise ships to dock right alongside the island, giving passengers easy access to the shore. Four different MSC ships will visit Ocean Cay during its inaugural season, calling on different days to avoid overcrowding. Sailings kick off on November 9, 2019 aboard MSC Seaside on a seven-night Caribbean cruise from Miami that also calls in Ocho Rios, Grand Cayman and Cozumel. Passengers are currently scheduled to have an estimated 14 hours to spend enjoying Ocean Cay. Suite guests will be treated to their own exclusive part of the island, the Ocean Cay Yacht Club beach and facilities. An outfit of the Aurea Spa also will be on hand to offer massages and treatments in sea-view cabanas. MSC is working with local environmental and marine experts to remove existing debris, and infuse the reserve with 75,000 native shrubs and plants, and a sea bed that will foster marine life (and provide for snorkeling and diving opportunities). A marine laboratory dedicated to researching climate change-resistant coral is also scheduled for construction. "It was a very special moment to be on the island together with the team that has been working non-stop on this incredible project to see how our vision is starting to take shape," said MSC Cruises executive chairman Pierfrancesco Vago, who recently visited Ocean Cay. "We are already seeing the return of the marine life that is usually so prevalent in this area. We are seeing an abundance of lobster, conch, stingrays and other fish, and by the time we finish the work the waters around the island will be again teeming with life and new coral. As a company with such a rich maritime heritage, preserving the oceans is of the highest importance to us and this is a wonderful opportunity to protect a little piece of paradise and allow our guests to experience it." All buildings also will be environmentally friendly, according to the news release -- including the island's focal point, a lighthouse that will also serve as a central meeting place for nighttime entertainment. MSC Cruises broke ground on Ocean Cay in January 2017; the private island was originally slated to open this November. More details about the guest experience ashore are set to be announced in the coming months.